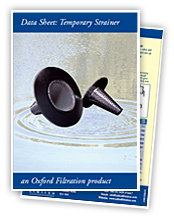 Oxford Filtration manufacture temporary basket strainers in all ratings and pipe sizes for virtually all fluid duties. 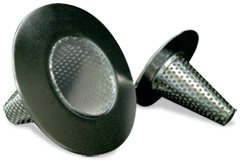 Temporary strainers are designed to provide inexpensive protection for pumps, meters, valves and other equipment during commissioning and start up. Materials available as standard are carbon and stainless steel but other special alloys on request. Standard stocked design to detail dimensions as below. Designs to customers specification available on request. For sizes and pressure ratings not shown, contact our sales office. Note: Temporary strainers are intended for commissioning plant or for use during maintenance and the user should assure themselves that the strainer is acceptable in the given application if necessary by contacting our technical help desk. Weights are approx only, based on RF type, for RTJ add approx 20%. For larger sizes, or higher pressure, please contact our Sales Office. All dimensions are subject to review, please contact the works for certified dimensions when required. Customer should ensure temporary strainer is cleaned if necessary and is not exposed to differential pressures in excess of 1 bar. NB* For strainers fitted with Ring Joint Gaskets, dimensions will be as above except A1 which will be modified to suit RTJ.